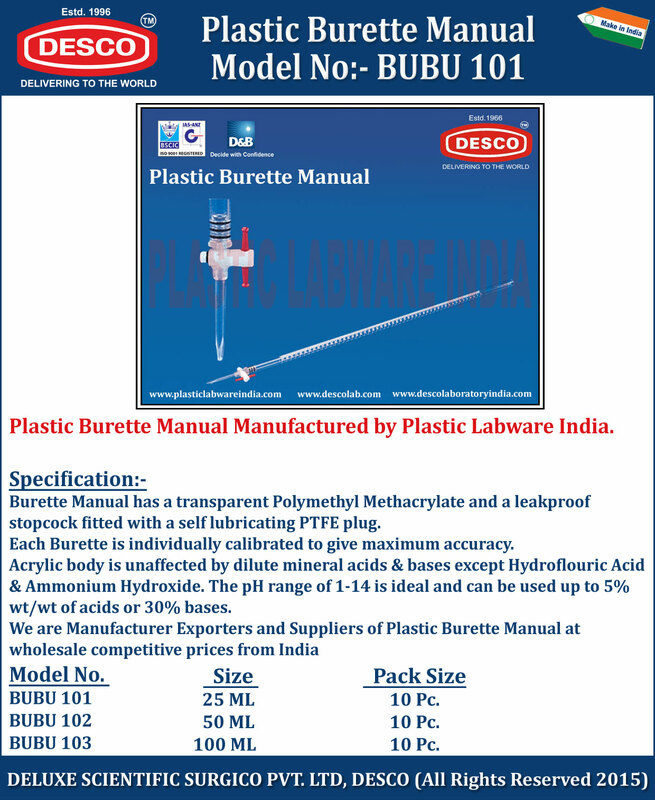 Burette Manual has a transparent Polymethyl Methacrylate and a leakproof stopcock fitted with a self lubricating PTFE plug. Each Burette is individually calibrated to give maximum accuracy. Acrylic body is unaffected by dilute mineral acids & bases except Hydroflouric Acid & Ammonium Hydroxide. The pH range of 1-14 is ideal and can be used up to 5% wt/wt of acids or 30% bases. We are Manufacturer Exporters and Suppliers of Plastic Burette Manual at wholesale competitive prices from India. BUBU 101 25 ML 10 Pc. BUBU 102 50 ML 10 Pc. BUBU 103 100 ML 10 Pc.